The illustrations sold out within a few minutes of going on line ... but you can still see the exhibition in London, see earlier post. The 2010 shortlist for the Branford Boase Award is announced. The Award is given annually to the author of an outstanding debut novel for children. The Branford Boase judging panel has an uncanny ability to pick future best-selling and critically acclaimed authors. Previous shortlisted and winning writers include Marcus Sedgwick, Meg Rosoff, Philip Reeve, Cathy Cassidy, Kevin Brooks, William Nicholson, Frank Cottrell Boyce, Mal Peet and Bali Rai. So, the pressure is on for this year’s eminent judging panel: Helen Boyle, editor of tBk magazine, Tricia Adams, executive director of the School Library Association, John Newman, children’s buyer at the Newham Bookshop and Chair of the Booksellers Association’s Children’s Bookselling Group and B R Collins, author of The Traitor Game, winner of last year’s Branford Boase Award. The panel is chaired by Julia Eccleshare, children’s books editor of The Guardian. The winner of the award will be announced on July 14th at a ceremony in London. The winning author receives a cheque for £1,000 and both author and editor receive a unique, hand-crafted silver-inlaid box. "The objective of the Just Read Campaign is for every child in the UK to become a reader. This campaign is not about making children functionally literate. It goes beyond that. All the research shows that the child that reads for pleasure is more likely to achieve. Unfortunately, both the government’s own statistics and international research show that reading standards are not improving in the UK and that enjoyment of reading is declining. Not every child comes from a reading home. Sometimes, these children are denied the cognitive, social and cultural advantages that reading for pleasure provides because their schools do not have a reading culture either. These children are doubly let down." Carousel urges everyone to sign this petition and join this extremely worthwhile campaign. 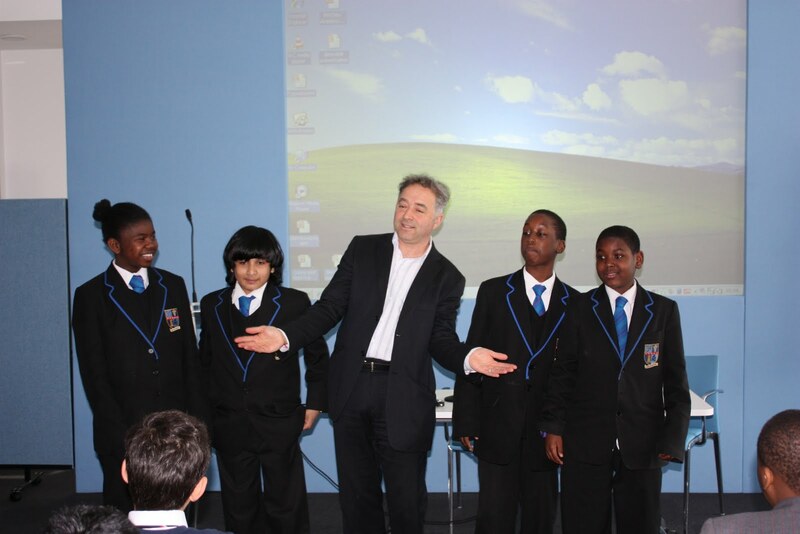 Photograph taken on 12th May - Frank Cottrell Boyce with students from Petchey Academy in Hackney, London who won the best student presentation prize in the Hackney Schools’ Short Novel Awards for a detailed and original response to short novel published by Barrington Stoke. The event was organised to celebrate achievements of students taking part in a pioneering programme run by the Learning Trust in Hackney. Winning readers – students from five secondary schools in Hackney have been taking part in ‘Literacy Intervention Toolkit’ (LIT), a pioneering programme, run by the Learning Trust, created to tackle low levels of literacy and to encourage reading for pleasure. By the end of the year most had read five Barrington Stoke short novels. The purpose of the event was to provide low level readers with the same opportunities as Gifted and Talented students. Petchey Academy won the prize for the best student presentation for their detailed and original response to Joanna Kenrick’s ’Mindset.’ They won cinema tickets for the Vue in the Angel. 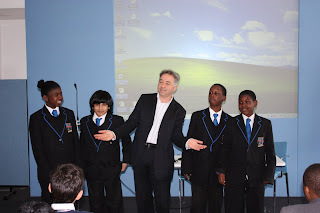 At the end of the day the students voted for the book they wanted to win the Hackney Schools’ Short Novel Award. The winner was the gory Night Hunger by Alan Gibbons, followed closely by Frank Cottrell Boyce’s comedy read, Desirable. "I am delighted to win this award. Anyone who can help young people develop the Reading habit is giving them a precious gift. Thanks to the young people of Hackney for this recognition." Many thanks to Linklaters and Get Hackney Reading, whose support has provided each school with a set of books as well as the gift of a book to each student, personally signed to them by the author. For children aged 2 to 5 Magic Carpet storytelling 11.30am Join us and fly away on the magic carpet, which comes to land in front of a different painting each day. Storytelling sessions last half an hour. Family Walk and Talk12.30–1.30pm Join us on a journey through the Gallery where we will walk, talk and bring paintings alive! DON’T FORGET OUR FREE FAMILY SUNDAYS! JUNE 2010 All sessions are free Every Sunday is Family Sunday at the National Gallery. Join us for a range of activities designed especially for families to enjoy and learn together. For families with children aged 5 to 11 Free hands-on art workshops at 11am, repeated 2pm, every Sunday. Meet in the Education Centre Foyer (Orange Street entrance). Workshops last two hours. Spectacular Journeys 20 June Travel into the distance and gain a new perspective in this drawing and paper construction workshop with artist Harriet Hill. A World Within a World 13 June Join artist Sarah Tombs to discover a wonderful world within a painting – then create your own. Marvellous Blooms 27 June Take a closer look at a fantastic floral painting in the National Gallery and make a colourful collage with artist Viyki Turnbull. Colourful Perspectives 6 June Explore the excitement of colour and new perspectives for making your own art with artist Robin-Lee Hall. More Gallery fun for all ages Family Walk and Talk 6 June12.30–1.30pm Meet in the Education Centre Foyer Join us on a journey through the collection where we will walk, talk and bring paintings alive! Trails and audio tours Print out a trail from www.nationalgallery.org.uk/families and explore the Gallery, or discover more with a family audio tour (available every day from the Audio Guide Desks). No need to book for workshops, talks or storytelling, but places are limited and allocated on arrival. Children must be accompanied by an adult to all events. For more information on National Gallery family events, please visit www.nationalgallery.org.uk/what or telephone 020 7747 2894/2885. an exhibition of artwork by the internationally acclaimed children’s book illustrator, Axel Scheffler. Wednesday 26th May – Sunday 6th June 2010. Free entry. Axel will be dropping in to sign books on Sat 29th May from 10.30am – 12.30pm and 2.30pm – 4.30pm. Featuring over 60 illustrations from books published throughout his career including; The Gruffalo, Room on the Broom, Stick Man, Mother Goose’s Nursery Rhymes, Tabby McTat, and many others; this is the first time so much of Axel’s original artwork will be on display and available for purchase. Bell Shakespeare’s Just Macbeth, directed by Wayne Harrison (Tap Dogs), is a really silly version of Shakespeare’s great big gory tragedy. It has got six funny but tragic actors, a garden gnome and a severed head that talks Shakespearean. Plus, there are witches, Wizz Fizz, ghosts, girl germs and weird Elizabethan things like soliloquies and sharp words and other things beginning with S.
An hilarious and irreverent take on one of Shakespeare’s most popular plays.